In the wake of the recent school shooting in Florida, Julia Cho’s “Office Hour” couldn’t be more timely. 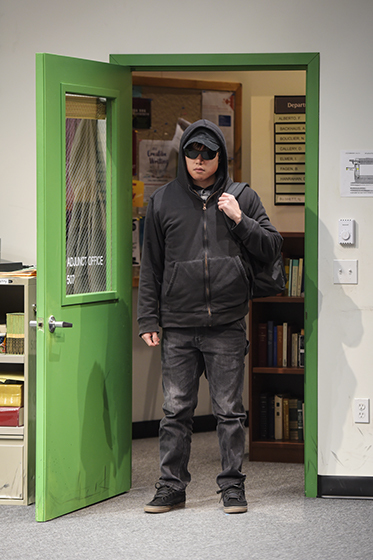 Presented by Berkeley Repertory Theatre, it focuses on a creative writing college student, Dennis (Daniel Chung), who could be the poster boy for mass murderers, and on a concerned instructor, Gina (Jackie Chung), desperately trying to break through his hostility. We hear about him before we see him as two of his previous instructors, David (Jeremy Kahn) and Genevieve (Kerry Warren), describe his behavior and his frightening writing. They’re trying to warn Gina, but she seems to think there’s some hope. That hope seems misguided when Dennis arrives at her office (set by Matt Saunders) for a required 20-minute conference. Dressed all in black (costumes by Maggie Morgan) with dark sunglasses, baseball cap and hoodie hiding most of his face, he’s scary. During their meeting, several scenes illustrate possible outcomes, all of them scary or even deadly, that take place in her imagination. After each one, their encounter resumes as if nothing had changed. Although she gradually gets this loner to open up about how he was bullied and how much he hates, Gina also reveals much about herself. Perhaps there’s a rapport between them because they’re both first-generation Asian American. In one of the more amusing scenes, she gets him to pretend she is his mother talking to him on the phone. The ending, or rather series of possible endings with all four characters, is chaotic. Lighting by Scott Zielinski and music and sound by Robert Kaplowitz enhance the effects. This co-production with Long Wharf Theatre of Connecticut is crisply directed by Lisa Peterson. Despite its tendency toward talkiness, it maintains one’s attention.